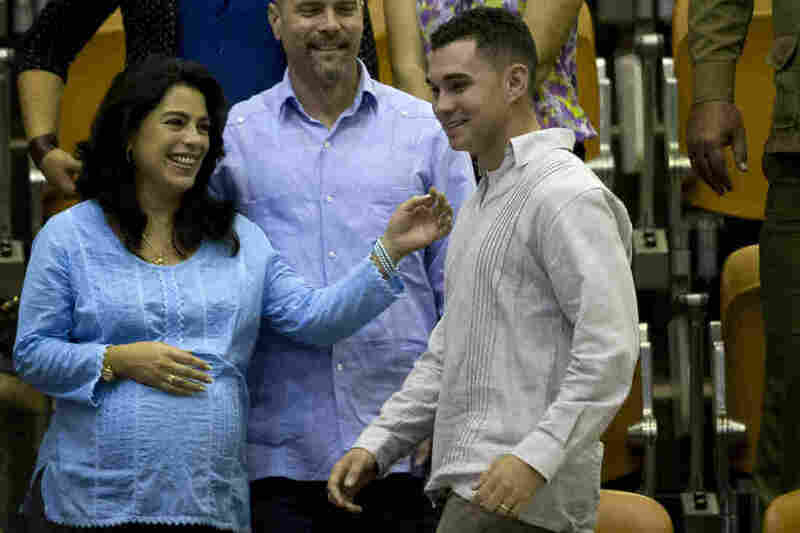 Elian Gonzalez Says He Would Like To Visit U.S. As A Tourist : The Two-Way Now 21, Gonzalez was seized 15 years ago from his relatives in Miami by U.S. officials who returned him to his native country. His mother died trying to reach the U.S. His father wanted him back. Elian Gonzalez attends the closing ceremony of the legislative session at the National Assembly in Havana on Dec. 20, 2014. Gonzalez tells ABC News that he would like to visit the U.S. as a tourist. Elian Gonzalez, the Cuban boy who was seized 15 years ago from his relatives in Miami by U.S. government officials who returned him to his native country, says he would like to visit the United States as a tourist. "For my family it has always been, we always have the desire to say to the American people, to say to each household our gratitude, appreciation and love that we have," he tells ABC News. "Perhaps one day we could pay a visit to the United States. I could personally thank those people who helped us, who were there by our side. Because we're so grateful for what they did." He tells ABC he'd like to see a baseball game, visit museums in Washington and talk to Americans. Gonzalez, now 21, was rescued in 1999 as a 6-year-old boy off the Florida coast where his mother had died trying to reach the U.S. His father in Cuba wanted him returned, but his Miami-based relatives tried to keep him. A legal battle went all the way to the U.S. Supreme Court, which rejected an appeal from the Miami family. Gonzalez was seized by government agents on April 22, 2000, and returned to his father in Cuba. ABC adds that Gonzales, who is studying engineering, is engaged to his high school sweetheart, also a student. He says that though he disagrees with his mother's actions in trying to come to the U.S., he is grateful for her efforts to keep him afloat even as she drowned. "I believe that if today she is not here with me it is because she fought until the very last minute for me to survive," he tells ABC. "After giving life to me, I believe she was the one who saved me. She was the one who gave life back to me at a time of danger."